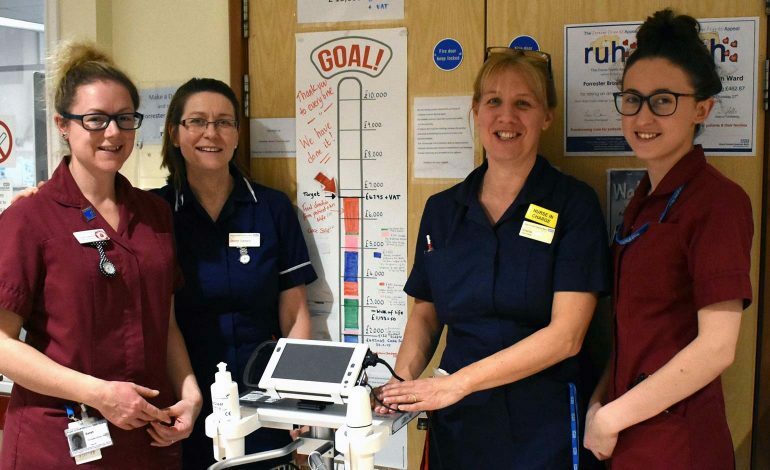 Patients at the RUH in Bath are to benefit from a new piece of medical equipment, thanks to generous donations and fundraising activities by staff, former patients, their families and the public. The machine does exactly what it’s called, using ultrasound it scans a patient’s bladder to determine the volume, helping staff manage incontinence care, reduce catheter intervention as well as identify if a patient’s kidneys are functioning well pre or post operation. Georgina Gallagher, ward manager on Forrester Brown ward said: “On behalf of my team, we would like to thank everyone who has made a donation to help us purchase this machine. “Many of our patients, their relatives and visitors gave generously as they wanted to give something back in return for the care they received, and we are truly grateful for their support. “It was a real team effort by all to raise the money. My staff also got stuck in with the fundraising and took part in The Forever Friends Appeal’s Walk of Life event, walking 10 miles and 26.2 miles for sponsorship money. This year, with the help of hospital charity, The Forever Friends Appeal, the ward staff are planning to do more fundraising to fund a mobility aid called a Sara Stedy which ensures sit-to-stand transfers are carried out safely and with ease, and a chair with removable arm rests suitable for helping transfer patients from a chair to a bed when they are unable to weight bear. Anyone wishing to make a donation to support a ward and department at the RUH can be made online via The Forever Friends Appeal website: www.foreverfriendsappeal.co.uk.